History is what shapes the present and for me it is what shapes my furniture! For me, the best way to understand traditional furniture is to build it. Doing so, with the correct set of tools available, allows you to learn and recreate history on an entirely different level. Surviving pieces have so very much to teach us about the tools, the techniques and even the craftsmen that to over look any subtle details is an injustice. 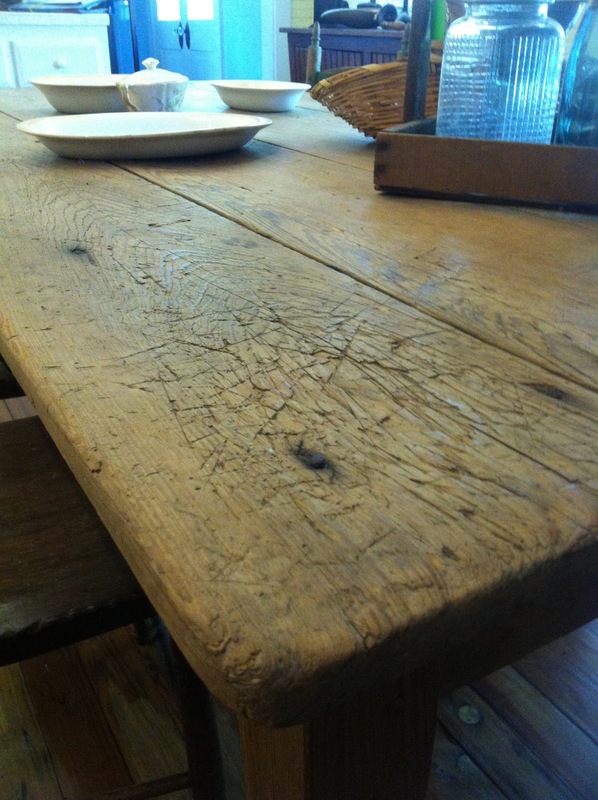 I did a brief study of a mid to late 19th Century Acadian Table housed at the Tee Joe Museum in Gonzales, LA. It's simple design is typical for the furniture of utility that was quite common in Acadian homes of the South. I did not have the time necessary to truly dissect this piece, it was an initial viewing to establish prominence of the piece. I took plenty of pictures and I will be going back again in the near future for further study. 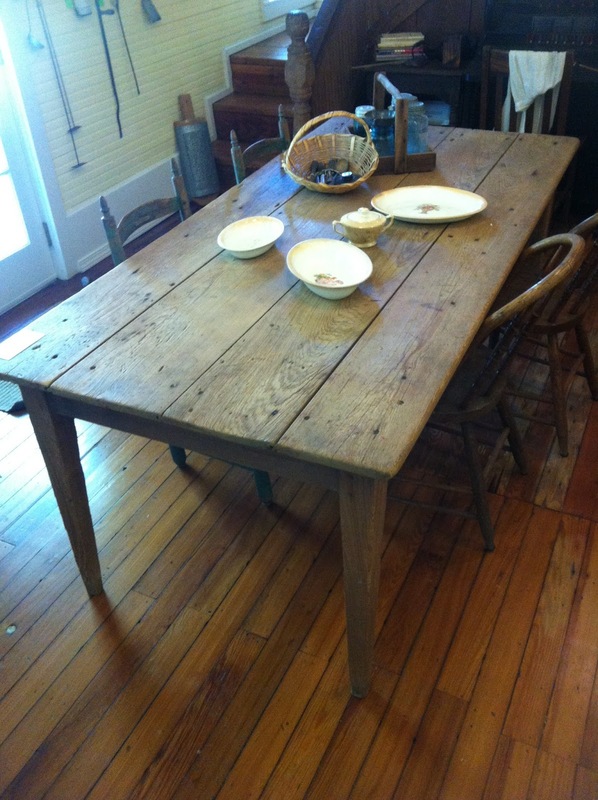 This Acadian Cypress table measures approx 76-3/4"x37-1/2"x30" with 2-3/4" legs tapering down to 1-1/2". I am going to share some of those pictures with you here, but stay close! I'll be doing a full Deconstruction / Reconstruction of the table soon... Videography options are being determined at the moment. Here it is! Notice the simple tapered legs. It is made of Cypress lumber and completely lacking of any profiles or other embellishments. 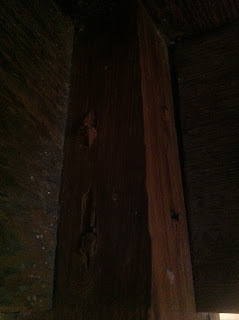 The top is composed of tongue and groove boards a little over 9" wide and secured to the apron using iron nails. I will be doing a little more research on these nails before I comment on them. 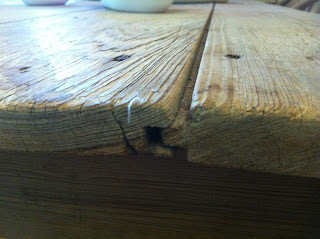 The table tops apparently was not glued together, hence there being no issues stemming from seasonal wood movements. To one corner of the table you see extensive wear and the marks of a kitchen knife. It would appear this table served double duty as a place to prepare dinner and eat it. The table's Mortise and Tenon joints are assembled using through pins. Not noticeable in the pictures the pins appear to have been square tapered sort with a glue groove - which would imply hide glue was likely used on these joints. 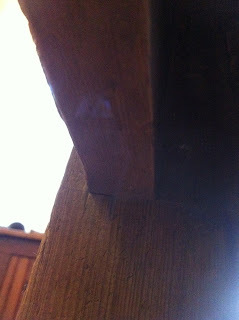 Some of the unclipped pins protrude an inch visible only from under neath the table. 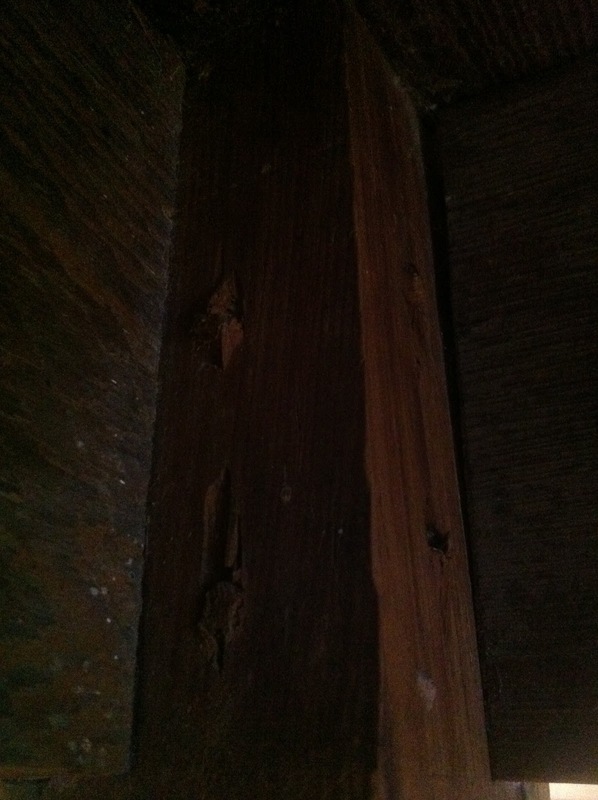 Close inspection shows layout markings at every joint. 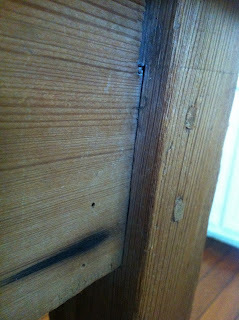 You can see a line scribed on all four sides of this leg for marking the top of the mortise. 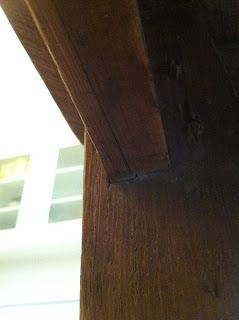 Notice it is not a Table Tenon. 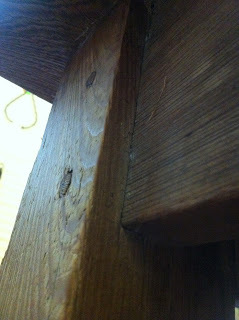 Here you can see the line of the marking gauge struck to mark the tenon of the apron. It is clearly visible that the mortise was marked with a gauge. It is possible that this was done with a mortise gauge however this is unlikely. As above, check back as I will be doing a full study and reproduction of this piece in the future.